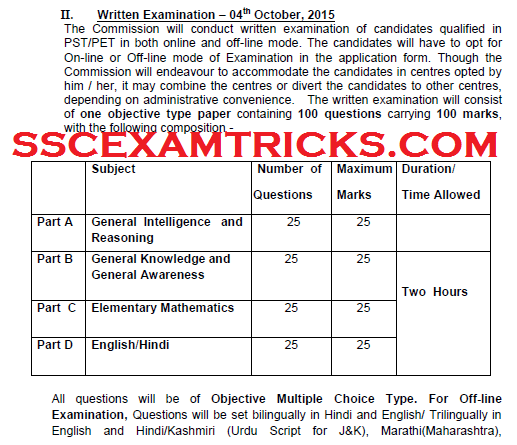 The PET/PST qualified candidates will be called for written examination which is scheduled on 04th October 2015.
at various centres i.e. Bhagalpur, Muzaffarpur, Agra, Bareilly, Gorakhpur, Kanpur, Meerut, Varanasi, Allahabad, Patna, Lucknow, Kolkata, Midnapur, Port Blair, Sambalpur, Gangtok, Jalpaiguri, Bhubaneshwar, Cuttack, Ranchi, Siliguri & Berhampur (Ganjam), Bangalore, Thiruvananthapuram, Kochi, Thrissur, Gulbarga, Mangalore, Dharwar, Kozhikode (Calicut), Delhi, Jaipur, Jodhpur, Kota, Bikaner, Udaipur, Ajmer, Alwar, Sriganganagar, Dehradun, Haldwani, Almora, Srinagar (Uttarakhand), Guwahati (Dispur), Itanagar, Dibrugarh, Jorhat, Silchar, Imphal, Shillong, Aizwal, Kohima, Agartala, Churachandpur, Hyderabad, Chennai, Madurai, Vishakhapatnam, Aurangabad, Mumbai, Kolhapur, Nagpur, Panaji, Pune, Ahmedabad, Vadodara, Rajkot, Nashik, Amravati , Surat, Ambikapur, Indore, Jabalpur, Jagdalpur, Chindwara, Chattarpur, Guna, Mandsaur, Jhabua, Khandwa, Rewa, Raipur, Bhopal, Gwalior, Bilaspur, Jalandhar, Leh, Chandigarh, Jammu, Srinagar(J&K), Shimla, Bhathinda, Hamirpur, Anantnag, Baramula, Rajouri, Kargil and Dodda. Candidate had already made choice of examination and exam centre in application form. In ONLINE Mode, the exam will entertained through filling of circles on Computer by clicking circles on Computer by mouse only (without the use of Keyboard). A rough sheet will be provided for manual calculations during the examination. This rough sheet must be deposited to the duty officer after completion of online written examination. There is no OMR sheet will be filled by Blue/Black ball point pen. For on-line examination, instructions on the computer screen may be followed. In Offline Mode, there will be OMR sheet which will be filled by Blue/Black ball point pen. In Pen Mode/ Offline Mode, the exam will be entertained through filling of circles on Computer Generated Page known as OMR Sheet containing information of answers which will be selected by filling circle in it. This OMR sheet will be filled by Blue/Black ball point pen. Candidate should write and code his/her name, Roll Number, Name of the Examination as mentioned in Admission Certificate, Date of birth and Test Form Number correctly, in the relevant places, in OMR Answer Sheet. They are also requested to affix their signature and Left Thumb Impression in the boxes earmarked for the purpose. In this examination no rough sheet will be provided for calculation in written examination. For Off-line Examination, Questions will be set bilingually in Hindi and English/ Trilingually in English and Hindi/Kashmiri (Urdu Script for J&K), Marathi(Maharashtra), Gujarati(Gujarat), Malayalam(Kerala), Kannada(Karnataka), Telegu (Andhra Pradesh),Tamil (Tamil Nadu), Oriya(Odisha), Bengali(West Bengal and Tripura), Punjabi (Gurmukhi script for Punjab),Assamese (Assam & Arunachal Pradesh),Manipuri(Manipur) and Mizo(Mizoram). The written exam will be conducted on 04th October 2015. The Exam will be conducted on Pen Mode/ Online Mode. There will be a multiple choice questions paper containing subjects English/Hindi (25 questions of 25 marks), Reasoning (25 questions of 25 marks), Elementary Mathematics (25 questions of 25 marks) and General Knowledge & General Awareness (25 questions of 25 marks) questions. The total marks for exam will be 100 marks of 100 questions and duration will be 2hrs i.e. 120 minutes. There will be a negative marking of ¼ to each wrong answer deliver in the MCQ. The minimum qualifying marks / cut off percentage of marks for selection will be for General and Ex-servicemen 35% marks and for SC/ST/OBC 33% marks. General Intelligence & Reasoning - Analytical aptitude and ability to observe and distinguish patterns will be tested through questions principally of non-verbal type. This component may include questions on analogies, similarities and differences, spatial visualization, spatial orientation, visual memory, discrimination, observation, relationship concepts, arithmetical reasoning and figural classification, arithmetic number series, non-verbal series, coding and decoding, etc. General Knowledge and General Awareness - Questions in this component will be aimed at testing the candidates’ general awareness of the environment around him. Questions will also be designed to test knowledge of current events and of such matters of every day observations and experience in their scientific aspect as may be expected of any educated person. The test will also include questions relating to India and its neighboring countries especially pertaining to sports, History, Culture, Geography, Economic Scene, General Polity, Indian Constitution, scientific Research etc. These Questions will be such that they do not require a special study of any discipline. Syllabus for Part C - This paper will include questions on problems relating to Number Systems, Computation of Whole Numbers, Decimals and Fractions and relationship between Numbers, Fundamental arithmetical operations, Percentages, Ratio and Proportion, Averages, Interest, Profit and Loss, Discount, Mensuration, Time and Distance, Ratio and Time, Time and Work, etc. Candidates ability to understand basic English/ Hindi, his basic comprehension would be tested. 1. Use of mobile phone/Calculator/Electronic gadgets is banned in exam room.